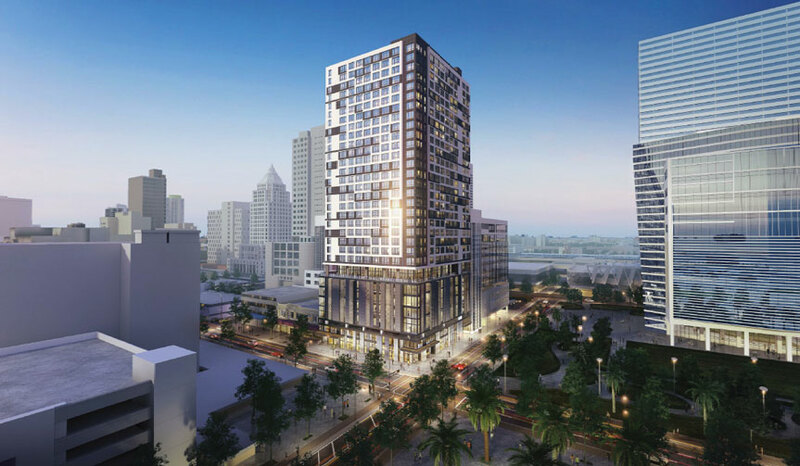 Final details have been worked out on a planned public-private partnership set to bring multi-family apartments and retail development to downtown Miami. Grand Station Partners LLC plans to build a 31-story residential tower attached to the Miami Parking Authority’s Courthouse Center Garage at 40 NW Third St. It was the authority’s decision to redevelop the vacant land it owns next to its 11-story flagship garage that led to the project. The city’s Urban Development Review Board recently recommended approval of the project. The new building is to have a pedestal of new parking with about 376 spaces, tied into the existing garage. The new building will have about 5,000 square feet of ground floor retail uses. Opened in 2010, the multi-level Courthouse Center Garage has upper and lower office space and some ground floor retail. The largest office use in the building is by the parking agency itself, which takes up about 10,000 square feet on the top floor. The authority calls the vacant lot next door Parcel B – not to be confused with the county’s Parcel B on the bayfront. The undeveloped site at 240 N Miami Ave, has grass, sidewalks and small trees. Authority CEO Art Noriega told the review board the garage was built in 2007-2008, with an eye toward developing Parcel B later. “When we developed our garage we designed it for future expansion, to the east on Parcel B,” he said. Once the real estate market bounced back, the authority looked at the public benefit of added parking plus residential uses for downtown, Mr. Noriega told the board. Once All Aboard Florida announced its plan for Brightline passenger rail service, and the MiamiCentral project, “we saw this as our opportunity to create critical mass,” he said, with the additional benefit of an infill project filling in the urban grid. “Our board is excited about the project,” Mr. Noriega said of the Off-Street Parking Board and the Grand Station Partners project. Grand Station Partners is requesting several waivers for the project, including lot coverage of 88%, above a cap of 80%; substituting a commercial loading berth for two residential berths; smaller setbacks; a 10% reduction of driveway width, and others. Speaking on behalf of the developer, attorney Iris Escarra detailed the plans for the interconnection with the existing garage. Not only is the project a public-private partnership with parking authority, but it is a joint venture of two architectural firms: Zyzcovich Architects and Frances Anillo Toledo LLC. A major factor in the Grand Station Partners’ project is an agreement with the next door property owner, developer Moishe Mana, who owns the land south of Parcel B, explained Ms. Escarra. Litigation filed by Mr. Mana was settled among the three parties this year. A key to the accord is a sublease of air rights, or the space above the new parking levels. On Feb. 1 the parking board approved a sublease between Grand Station Partners LLC and Mr. Mana’s North Miami Ave Realty LLC, and an amendment to a ground lease the authority has with Grand Station, which includes consent to the sublease. The sublease encourages the developers to work together to build out the east side of a city block. Ms. Escarra told the design review board about Mr. Mana’s involvement and said the projects share an architect. “There is a lot of coordination and harmony,” she said. An architect with the Zyzcovich firm told the review board the overall plan is to bring residential units to a mostly commercial district and provide additional public parking. The lease between the parking authority and Grand Station Partners spells out the main gain for the authority: a six-level expansion of its garage, adding about 350 parking spaces. An additional 26 spaces will be devoted to the new building. The existing garage has 840 spaces. The sublease says Mr. Mana’s company intends to build a high-rise mixed-use tower on its neighboring site with ground-floor retail, a 150-room hotel with ancillary support, offices and residential. Part of the project will extend above the Grand Station garage “by either using a cantilever method which would not change or impact Sublandlord’s original plan for this portion of the parking garage… or designing a building with structural elements which will rely upon certain components of the parking garage for support and foundation…,” the sublease says. Design review board members asked about a planned amenity deck with a swimming pool for the Grand Station Partners’ project. Board member Gerald Martson said, “Given all of the articulation of the building, the patterns … it looks like somebody forgot to design the amenity deck.” He said more development of the deck plan was needed. “I would have liked to have seen more glass,” said acting Chairman Dean Lewis. A condition of recommending approval is that the developer considers other treatments for the façade on the west elevation. The site is about a block from MiamiCentral, now under construction, with its promise of high speed passenger trains. affordable housing over its garages. Otherwise, don’t come to the dais looking for commissioner blessings on its latest ventures.